I am intrigued by the impact of internet on human lives. This book is about an aspect of it. As Steven Pinker(cognitive psychologist, linguist, and popular science author) states in the foreword, “this is a book about a whole new way of studying the mind” and, I would add, human behaviour. This book is less about big data science than about the new innovative ways of thinking, of designing, and of approaching the questions we ask of our life. Stephens-Davidowitz makes his points by regaling the reader with early Big Data collected through Google searches and clicks, predominantly. Facebook also features as with other Silicon Valley data companies. “everybody lies” gives new and interesting insights into matters such as the effect of assassination of leader on a country’s economy, or going to a great university equates to a better career or larger paycheck. Stephens-Davidowitz provides a definition of “data” which is no longer limited to numbers or words. For a data scientist such as he, Big Data has four virtues. First, Big Data as “digital truth serum” as people are most honest without an apparent audience leading to honest data on say, sexual preferences or racial discrimination. It provide honest data. Second, it offers a way to run large-scale randomized controlled experiment through the click of the mouse. Third, Big Data allows us, through the large scale sample, to zoom in on subsets of people and with greater accuracy. Fourth, Big Data provides new types of data. What’s logical and rational before is no longer enough nor are the experiment results accurate enough. The scope of our sample size has significantly increased withe the internet, so why think small? That is not to say, as Stephens-Davidowitz points out, that Big Data is the answer but it is a valuable resource which we are ill-advised to ignore. Information is king or queen, and this is truer than before. Social science is becoming real science, Stephens-Davidowitz says. Why? Read the book. Stephens-Davidowitz encourages us to approach this field with curiosity and creativity when contemplating how we use and manage data. Data however is neither good or evil; it is powerful. 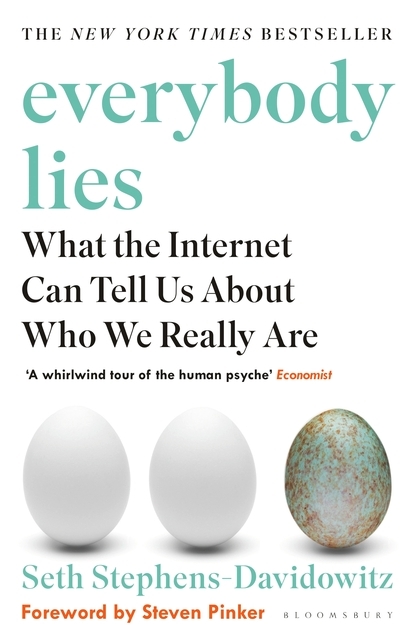 In “everybody lies”, he cautions against what Big Data cannot do and what we shouldn’t do with Big Data. Reading this book is a pleasurable journey. Highly recommended. Reblogged this on MEANINGS AND MUSINGS.